International social media will become a huge topic in the near future. Social media internationally has still not flourished as a whole. We’ve all witnessed the social media takeover within the United States. You can’t go a day without overhearing a key social media word. Every ad we have to watch through on TV now includes a Twitter, Facebook, and Iphone app logo on the bottom of their ad. Or they even shout it out, “Follow Us on Twitter!”. The other day, I was driving on the highway and even saw moving billboards that said “Make sure to Like Us on Facebook!”. It’s been pretty overwhelming over here on the other side of the Pacific to say the least. Before you know it you’ll probably be receiving social media fliers on your front door step. So, how’s the rest of the world reacting to the social media extravaganza? By looking at the amount of internet users internationally we can determine which countries have the most potential with social media. 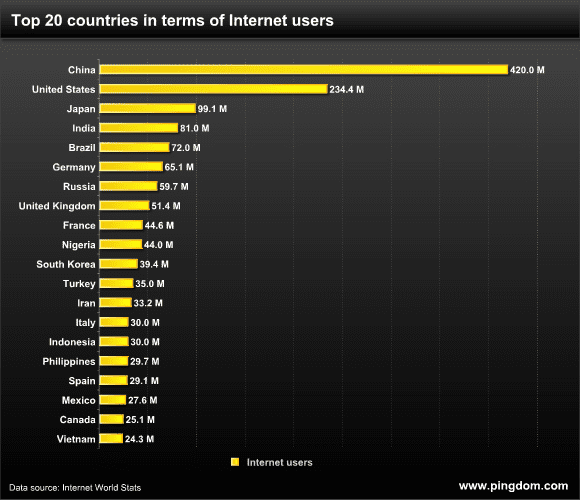 The most populated country in world, China has unsurprisingly taken the title for this with over 400 million internet users. The United States stands right behind with just under 230 million. Looking at those stats we can really see how much time Americans spend on the internet. The following list below was compiled by Pingdom.com. Now we would all think Facebook would be the leading social media source even outside the United States boundary, that is not the case. QQ still leads as the number one social media site in China by a long-shot. France’s Skyrock has over 22 million users, still ahead of the Facebook users. Germany has continued to stay loyal to Studio VZ Network. India is still involved with Okrut. Some countries that have noticed the switch from their countries most popular social websites to Facebook include Mexico and Spain. Tuenti is still increasingly popular in Spain, but has felt the presence of Facebook. Mexico has switched to the Facebook community in droves following other top Facebook countries Canada, Australia, England, and Turkey.